The What: Sharp Imaging and Information Company of America (SIICA), a division of Sharp Electronics Corporation, launched two new lines of its 4K Ultra-HD LCD (3,840 × 2,160-pixel resolution) commercial displays. The What Else: Sharp's PN-HM Series includes the PN-HM651 65" Class (64 ½" diagonal), PN-HM751 75" Class (74 9/16" diagonal) and PN-HM851 85" Class (85 9/16" diagonal) displays. They each provide a brightness of 500 nits, are designed for 24/7 environments and are built to handle a range of signage needs, from simple set-ups to large networks with multiple displays. 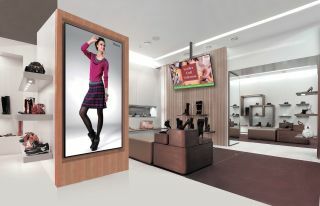 The Bottom Line: The durable and highly flexible displays can support a wide range of signage needs. Whether installed in a shopping mall, transport hub, or conference hall, they provide powerful signage solutions that deliver content and messages with style and precision.